Bob has over 10 years experience in servicing clients. With an expansive knowledge of loan products and programs, Bob enjoys the nuances of the business, finding that perfect niche program for your needs. Bob will spend the time to really understand your needs, and come up with several proposals that all accomplish your goals. Bob is a native Washingtonian and earned a BS in Management from Towson University. When he is not working on your transaction, Bob is probably at the Skins or Nationals game or teaching his son how to play the drums. He is very personable and is always willing to go the extra mile for you. First, you have to simplify what points are. Paying points allows you to buy your rate down to a point lower than if you had paid no points at all. The way to tell whether points are worth it is to look at how long you are going to be in your home. There is a break even point. If you plan to be in your home longer than that point, then it’s worth it. If not, then it isn’t. If for your $375,000 home, you are quoted 5.875% on a 30 year fixed (paying a point), your Principal and Interest payment will be $2,218.27 monthly. If for the same home, you are quoted 6.25% paying no points, your payment would now be $2,308.94, a difference of $90.67 monthly. But, Bob, what exactly is a point though?! How is that calculated? Well, one point equals one percent of your loan. The larger your loan, the larger that point is worth. In the case above, let’s say the loan is for $250,000. This would mean that paying a point would cost $2,500. You simply have to look at how long you’d have to be in your house to break even on paying that point. If you are saving $90.67 each month for paying the point which cost you $2,500, it would take you 27.57 months of those savings to recoup your $2,500. Figuring the monthly savings will require a financial calculator, which I happen to supply here on my website. Therefore, after living in your home for 27.57 months, the on-going monthly savings of $90.67 becomes true savings..
What is cash-out refinancing? Cash-out refinancing allows you to take the equity you�ve built in your home and use it NOW for things you need. 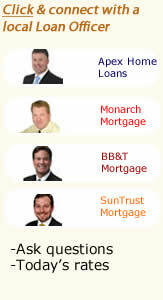 You simply refinance your mortgage for more than you owe and then pocket the difference in the form of cash. This can be ideal for funding college education, buying a car, building an addition, or even investing. You use it as you see fit. Tax-deductible interest: The interest you pay for cars loans and credit card debt is not tax deductible. Paying these debts off with cash from your home equity is! This can save you hundreds, or even thousands of dollars per year. Unlimited uses - Use the money to pay off higher interest loans, finance home improvements, to purchase a vehicle - whatever you�d like! Lower Monthly Payments � Consolidating debt can often lead to lower overall monthly payments than you make currently, and it adds the benefit of getting out of debt with your creditors. What to do with this extra monthly money? You can choose to make larger payments towards your home to again build equity or use the money for projects you�ve always wanted to do, or for vacations or holiday spending. Any closing costs can be financed in the new loan so there aren�t any out of pocket expenses. Interested to see if you could benefit similarly? I�m happy to go over your particular scenario to show you the possibilities. Call or email me to see how easy it is.